The Marigold Festival has had an interesting history. In 1970, the idea of an annual festival in Winterville was conceived by citizens, including former mayor, Wesley Whitehead, Joan Biles, and Sybil Deacon, as a means of revitalizing community spirit and reversing the decay prevalent in the city buildings such as the historic train depot. The marigold, adopted as the town's official symbol in 1971 was chosen because of its hardiness, versatility, and vigor, and because it is a symbol of friendship all over the world. Funds from Marigold Festivals were used to beautify and improve the community. Past festivals funded renovations of several buildings, including The Depot, furnished the building for the Winterville branch of the Athens Regional Library, built a playscape in the park, plus many other projects. The Marigold Festival, held from 1971 through 2002, was discontinued in 2003, but no one had forgotten it. 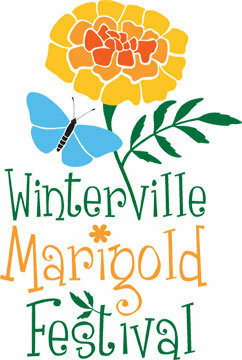 Stories and memories of the Marigold Festival continued to abound and as new families moved into Winterville, they too heard those stories. Rather than relive just stories and memories, a couple of the new residents, including past Executive Director, Emily Eisenman, along with a few past organizers got together and decided to revive the Marigold Festival. With the blessing of then Mayor Jim Mercer and the City Council the new organizers have once again brought the exciting, fun-filled, Marigold Festival to life! Visit our our History page to learn more about the early years of the Marigold Festival. Find us on Facebook for the most up-to-date information about the Festival.